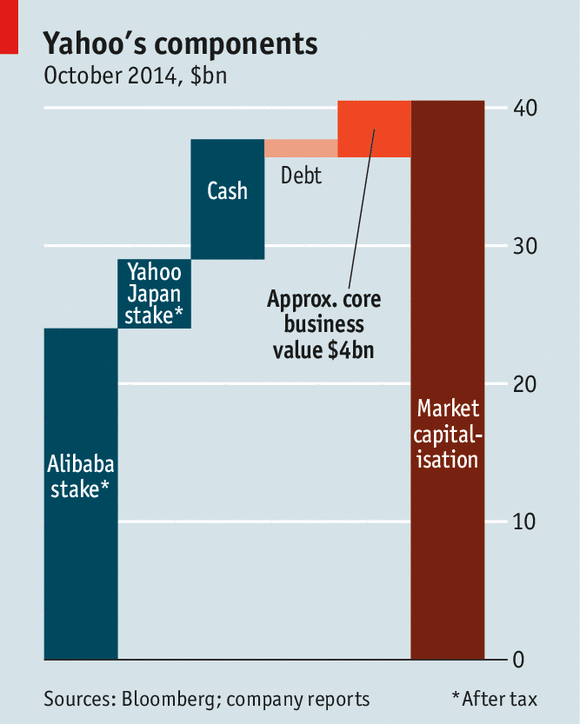 A while ago the Economist featured this graphic to demonstrate the true value of Yahoo’s core business after stripping away all of it’s holdings. Holdings included Alibaba, Yahoo Japan, it’s cash and debt. By examining the underlying asset, we can predict how defensible and powerful it truly is without having to deal with any of the fat. Now with Yahoo looking for a potential buyer, this analysis is more important than ever. A potential sale of Yahoo’s core business is a complex issue that will take a long time to reach a conclusion, Needham & Co. analyst Laura Martin said. “Everybody’s smart here, but there isn’t a clear path to maximizing value, and nobody agrees on the path,” she said. “It’s just a big, complicated mess.” But she stressed that a sale of Yahoo would only make sense if someone acquired the whole entity, rather than selling off the company’s smaller “crown jewel” assets separately. They won’t command the same type of multiple Yahoo is seeking, which is in the ballpark of 6 to 8 times its $800 million EBIDTA. New York City rent and apartment prices are fair because they can be justified from the bottom’s up. We’ll compare this to Miami, which in our opinion is not correctly priced. Availability of high paying jobs and tourism are the leading two factors. Jobs account for keeping residents’ money in NYC full-time (i.e. taxes and spending in local business). 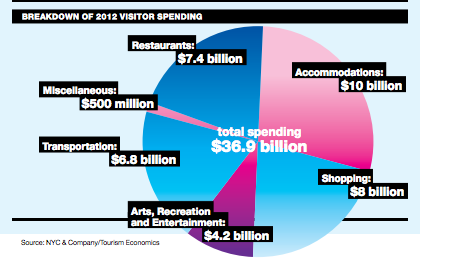 Tourism brings in an even flow of outside money being spent in local businesses. What keeps tourism active is the vibrant cultural hub. Private sector employment in New York City rose by 107,000, or 3.0 percent, to 3,687,700 for the 12-month period ending January 2016. Manhattan’s average weekly wage of $2,847 was the highest among the nation’s 342 large counties. Within Manhattan, the financial activities super-sector had the highest first-quarter average weekly wage, $8,932. Information had the second-highest average wage ($3,177), followed by natural resources and mining ($3,085) and professional and business services ($2,667). 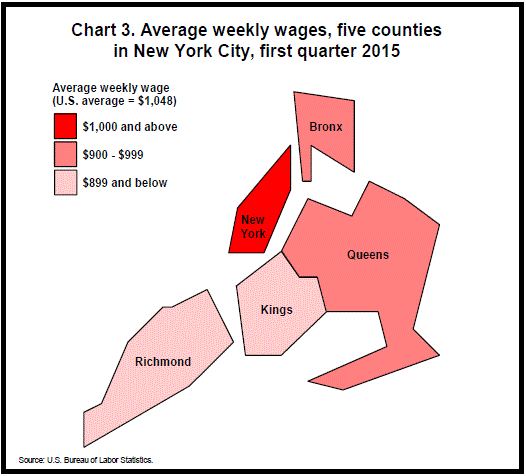 Manhattan’s leisure and hospitality supersector had the lowest average weekly wage, $834. 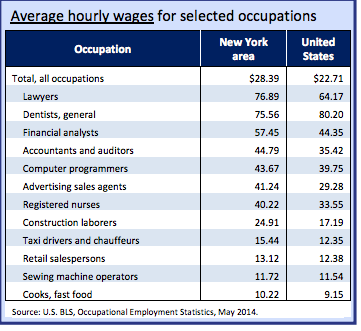 Wages in every supersector were higher in Manhattan than their respective national averages. Total nonfarm employment for the Miami-Fort Lauderdale-West Palm Beach Metropolitan Statistical Area stood at 2,483,400 in September 2015, up 56,400, or 2.3 percent, over the year, according to the U.S. Bureau of Labor Statistics. Also NYC wages are higher. 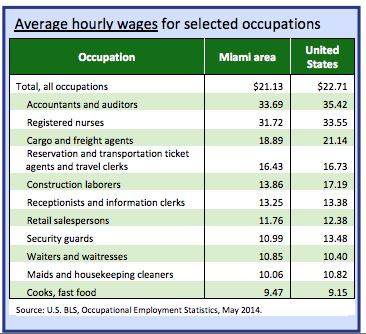 Let’s compare the selected occupations for Miami in the above chart and compare it to NYC. In Miami, during the recession a large share of the jobs lost were from industries where the typical worker earned a higher-than-average wage. The annual wage of the typical job lost during the recession was $45,500. 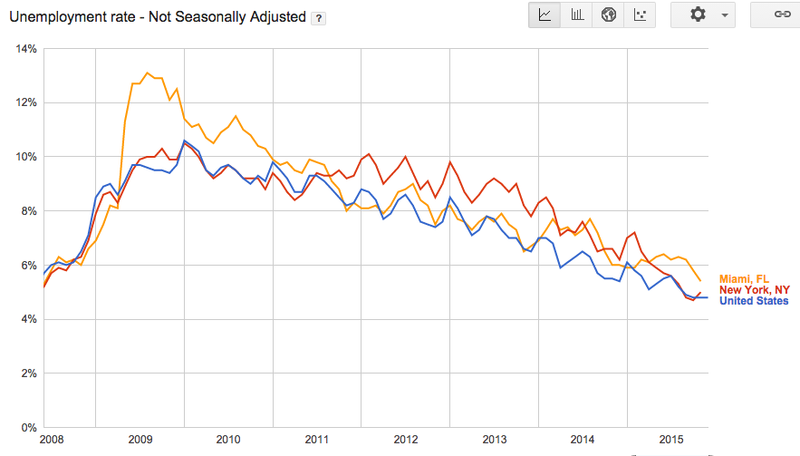 During the recovery, however, most of the job growth has been in industries that pay lower-than-average wages. The average wage of the typical job added during the recovery is $37,900 (nearly 17% lower than the wage of workers losing their jobs in the recession). Although unemployment is relatively on average with the rest of the US, an anomaly in the economy (2009) had a higher impact on Miami that the rest of the US. In 2014, 14.6 million visitors stayed in Miami, according to the Greater Miami Convention & Visitors Bureau. The study estimated that they pumped $23.8 billion into it’s economy. However, New York City was the biggest single source of visitors. 1.9 million New Yorkers visited last year. Compare that to second place Chicago which only provided less than half a million. 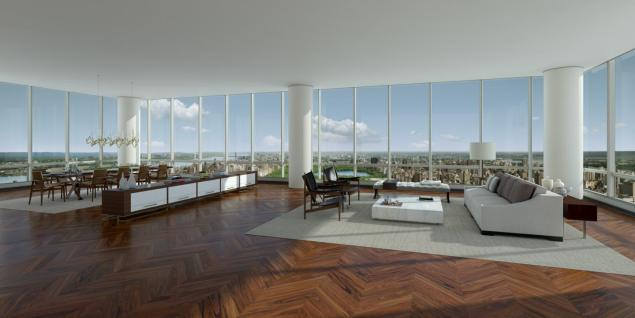 These domestic visitors (~2.5M) account for second home owners — where their primary residence is in NYC and Chicago. The main draw is the beach and not a vibrant cultural environment (restaurants, shopping, museums, Broadway shows, and parks) like it is in NYC. Residing in a place a few weeks a year doesn’t improve the economy in that area. It only benefits it seasonally.